A toenail fungus begins with debris under the toenail, and keratin debris is the most common type of build up. And, because of the problems it can cause, it’s no big surprise that most people want to know how to remove keratin under the toenail. A toenail fungus can cause many problems, from a nasty odor to crumbling nails. But, it can also work to break down proteins, such as keratin. Understand that keratin is a naturally-produced protein. Your nails need it to remain healthy and keep their tough exterior. Unfortunately, things like fungus can disrupt the production of keratin and can break it down. Think of a toenail fungus as a disrupting hammer, clobbering everything good in its wake. 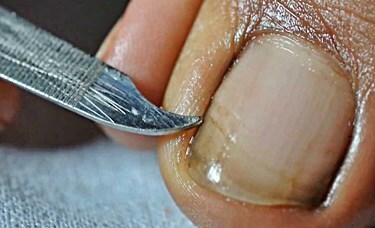 When it’s able to break down keratin into pieces, you’re left with a residue underneath the nail. A build up can cause more problems, so it requires immediate attention. If you don’t take action, it’ll get worse. One treatment used to remove debris and clear up an infection is Xenna Nonyx nail gel. It’s recommended by podiatrists, but it doesn’t require a prescription. 1.1 What is Keratin Debris? Before you find out how to get rid of keratin debris (other than the treatment we’ve outlined), let’s take a closer look at what keratin is, and what it does for your toenails. Keratin is made up of many layers of dead, flattened skin cells that contain protein. The leftover protein is used to create your fingernails and toenails. Without keratin, we wouldn’t have the hard shell exteriors covering our fingers and toes. So, be glad that these dead cells are building up and the remnants of their protein are being put to good use. But, if keratin is natural, why would we worry about it becoming debris? Since we now know that areas like fingernails and toenails are rich in keratin, it makes sense that it can be broken down and cause problems. When you have an infection, like a toenail fungus, it can deteriorate the keratin in your nails. This fungus, also known as onychomycosis, only needs to break down small amounts of the keratin for you to see the symptoms. If you’ve ever had a toenail fungus, and notice your nails start to crumble easily, that’s the breakdown of keratin. When those small particles manage to get underneath the nail, it’s considered to be debris. Again, one of the biggest symptoms you’ll notice with keratin debris is the crumbling of your nails. If they appear to break off easily or look jagged around the edges, there’s a good chance keratin is being chipped away. When the debris manages to get underneath the nails, it can build up quickly. Often, this buildup will cause discoloration, causing the nail to turn yellow or develop black spots. Too much of a build-up can cause extreme discoloration, and the nail can begin to separate from the nail bed. When this happens, you may need to remove the nail for proper treatment. There are dozens of possible treatments. Removing debris from underneath the nail can work with many of these solutions. But, the best thing you can do is try to prevent a build up in the first place. Essentially, preventing debris from getting underneath your toenail is the same as trying to prevent a fungus. Practicing excellent hygiene with your feet is a great place to start. It’s also smart to avoid public places (showers, pools, etc.) where your bare feet might be exposed. Be sure your feet have enough time to breathe each day. Wearing shoes that fit correctly, and antifungal socks can help to make sure you aren’t letting sweat get locked in. When you do walk around your home with bare feet, make sure your nails are clean and trimmed. Keeping dirt and moisture away from your toenails will reduce the chance of fungus and debris. Finally, be careful of the tools used around your feet. If you enjoy pedicures, the smallest error with a tool that hasn’t been properly sanitized can create a toenail fungus. The good news is that there are professional pedicure kits for use at home. Keep in mind that keratin is what gives your nails their hard exterior. So, when treating keratin debris, it’s important to soften things up as much as possible. An antifungal cream (either prescribed or over-the-counter) can help to soften the exterior of the nail. It will also treat the fungal infection, which can help to clear up the debris on its own. If you have an exceptionally tough build up, you can use manicure tools to remove some of the particles gently. Again, use cream to soften the keratin before ever attempting to remove any of it manually. If you’re uncomfortable with this particular option, and an antifungal cream isn’t working, consult your podiatrist for other treatment options. You should never dig at the nail with manicure tools, your fingers, etc. This can lead to an infection, and you could end up doing more harm than good. If the nail has started to separate from the nail bed due to debris, getting help from your doctor may be the best option. The nail might need to be removed for the fungal infection to heal. Debris is just another side effect. Thankfully, it isn’t hard to notice and can be treated fairly easily. When it comes to how to remove keratin or debris under the toenail, actually treating the fungus with an over-the-counter product is a great place to start. Softening up the hard proteins within the keratin should make it easy to remove, whether it disappears with the fungus, or you manually remove it with the proper tools. Could a Black Spot under the Toenail be Fungus? Does Toenail Fungus Cause Other Health Problems?